Before you leave the parking area, make sure you fill up all you need for a long day outdoors. There is a public toilet, a kiosk (in season) and other facilities at the main parking. Once you set off, there is nothing but nature and your fellow hikers. The trail is marked with the Trekking Association's red Ts. Signs show the distance remaining forward to the Preikestolen plateau and back to the parking. Whether you have just torn yourself away from breakfast at Preikestolen Mountain Lodge, or you have just arrived with car or bus from Stavanger - the first steps towards Preikestolen can be quite a shock. Surrounded by the dewy smell of pine forest, rocks and adventure, you may be gasping for your breath. The trail from the parking lot is the steepest part of the whole hike, but the climb is done in five minutes. On your way uphill, you hear a mixture of bird song, tongues from all corners of the world and the clicking of American stilettos on grey granite. Plastic bags are occasionally a sight as normal as backpacks. When you reach the first mountain plateau you should turn around. Deep down below, you'll see Preikestolen Mountain Lodge and Lake Refsvatnet with its excellent bathing conditions and water sport activities. As you lift your gaze, you may catch a glimpse of Stavanger city peninsula in the far distance - beautiful! If you have a weak mind, this is the moment of truth: Right beside the track a zip-line - the second longest in Norway - offers an easy flight back to the starting point! An amazing experience - which will be the perfect finishing touch after you have taken the trip to Preikestolen, so save the airy hovering tour for the way back! The path that goes on from the viewing point is a wide and clear path through a landscape of pine trees and the occasional polished rock. No other tourist path in Norway is better marked than this one. On your way to the top you pass, among much other, some 40 distance markers telling you how far you have left until you reach Preikestolen, but also the distance back to the parking lot. This makes it easy to divide both powers, food and refreshment breaks. Should you get so captured by the nature and your surroundings that you manage to go astray from the path, do not despair: Most missteps are marked with great stop signs that says: “STOP - you have now left the path to Preikestolen”. The elevation rises steadily. After all, you are climbing 350 meters in before you spot the blue waters of the Lysefjord far beneath you. Around you the sheltered forest coves for crooked birch and the nature renews its wonders behind each turn of the path. Even the marshes is passed with dry feet, you just walk right through on wide pavements made of tree, high enough over mud and swamp to keep your feet as dry as ever. 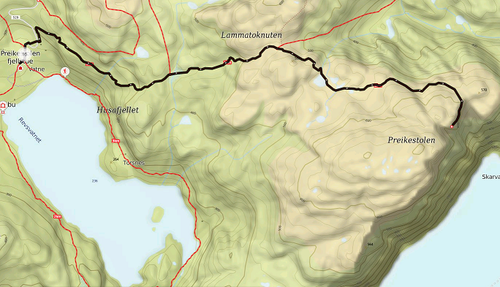 You have already conquered half the distance to Preikestolen. In front of you lies a ravine; Neverdalsskaret. Until just recently, this could be called a potential bone breaker; a steep rock scree filled with slippery blocks of rock that on a rainy day could be a threat to public health, health care and the sparetime of local rescuers. But this is not today. The last year this ravine have been transformed to a rock screes answer to Taj Mahal - in the figure of a granite stairway which your foot and, not least, your eyes will consider a sight of beauty. Nepalese sherpas have carefully placed giant blocks or rock with cleverness, manual power and ancient knowledge at hand. It is a judiciously intervention in nature made to protect vulnerable terrain and staggering tourists towards mutual destructions. As you take your last steps through the ravine of Neverdalsskaret, most altitude meters towards Preikestolen have been climbed, and are now behind you. Are you one of those who have realized that the area of Lysefjord can offer you several nature attractions and experiences, and not just Preikestolen? Now you can walk away from the crowded path towards Preikestolen, and instead embark on your hut-to-hut hike along the Lysefjord. If this is your path, look forward to a first class hike through world class nature, with attractions like Hengjandenibba, the mountain farm of Bakken, the unique village of Lysebotn, the dizziness of Kjerag, and the challenge of the 4444 steps of Flørli. But, back to the Preikestolen route: From the top of the ravine, you follow the rock paved path. Here and there you will get a good view of both fjord and mountains, then, up the last stone stairway and through a lush birch grove, lies the perfect place for a rest: Polished rock surrounded by three small ponds. During a sunny day these small lakes will be heated quickly, so toss away your clothes and enjoy a delightful bath! Refreshed and rested from your bath break, you take on the final stage on getting to your goal; Preikestolen. Just after passing the last pond, you reach a path cross. If you take to the right, you’re taking a path leading to Preikestolen from behind, through a smaller height, and then down a steep slope. Many prefer this alternative route on their return, for that picture perfect overlook of the plateau on the way back. Taking the main path straight ahead moves you through a more gentle terrain. But after some hundred meters, your pulse will rise: You can spot the Lysefjord! The majestic fjord that splits the bedrock in two. If you look to your left you can on clear days see all the way to Lysebotn, the innermost village of Lysefjorden, surrounded by steep cliffs - amongs them Kjerag. If you keep walking and follow the path you’re on to the right, the climax awaits you: Preikestolen! About 604 vertical meters above the Lysefjord, the plateau of Preikestolen is hanging, slightly swaying beyond the abyss. An amazing view as you walk the final meters of the path, which is replaces by a tingling feeling you might never have experienced before, as you step on to the great granite block with nothing but empty air on three of its sides. Enjoy! As you hike the same path back to Preikestolen Mountain Lodge and the parking area, you may chooce to "fly" the last bit - hoovering in a 350 meter long zip-line. The trail is clear from snow and ice, and conditions are good! Today slightly cloudy and wind from 3-5 meter per seconds. Check the weather befor your hike here.